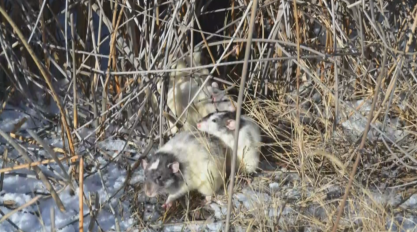 FORT COLLINS, Colo. – The Larimer County Humane Society has opened an investigation after they found more than 77 abandoned domestic rats in two open spaces Friday. According to CBS Denver, the humane society said all the rats were once pets, and were abandoned in cruel living conditions. "We don't come across dealing with rats on a daily basis," said Jason Downs, Animal Protection Control Officer for the humane society. Downs said the investigation began when two separate callers reported rats approaching them in friendly manners. One call came from the South Shields Open Space; the other came from the Riverbend Natural Area. "There were approximately 30 rats that were running up to (our callers)," Downs said. "They came out at a large, fast rate, coming from the bushes. You would be amazed by how many rats were coming out." Downs said the rats were clearly not wild, and had once lived together in a household. "You could tell, just the way they were reacting towards people. Running up to people, eating out of hands," Downs said. Downs said the rats were smart enough to stay together through a night in the snow in which temperatures dipped below 20 degrees. He said the rats used each other to survive by gathering in groups. "Just imagine having 15 to 20 rats all in a big ball. They were all on top of each other," Downs said. "Putting them in the snow, without food or shelter, is abandonment. It's cruelty," said Bill Porter, director of Animal Control. With the help of volunteers, the Humane Society worked to collect as many rats as they could. "I crumbled up peanut butter cookies, laid them on the ground and they came running to us," Downs said. Volunteers reported seeing other rats walking in the area. However, attempts to rescue them fell short before nightfall Friday. Porter said the person who abandoned the rats will face a charge of animal cruelty for each one recovered. At the time of this report, the suspect would face 77 charges. Each charge can come with a fine of $1,000, and time in jail. The Humane Society planned to offer the rats for adoption. Each one would receive testing and treatment first. "They seem like very sweet guys. You can't beat that face," Porter said. "We are going to do our best to find new homes for these guys." Aside from harm to the animals, the Humane Society said leaving these rats in the wild also could introduce new species to the area, attracting unwanted predators. They believed one rat did lose its life to a predator in the short time it was out.